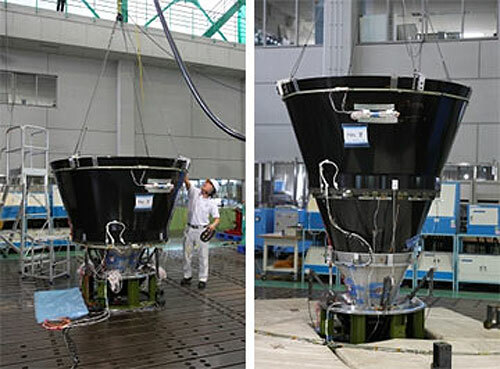 The extension test of the second stage motor nozzle of the Epsilon Launch Vehicle was held at the Sagamihara Campus in late September. This extension nozzle is a technology that was adopted for the kick motor of the M-3SII Rocket launched in 1989. The nozzle is extended by the force of a light-weighted spring shortened and installed inside the nozzle. The test this time checked the spring and extension mechanism of the nozzle for M-34c, the renovated type from the nozzle for the third stage motor M34b of the M-V Launch Vehicle. The nozzle was verified to work properly through the test. As part of our research on the next-generation solid propellant rocket, we plan to reduce the cost by a third of that for the former M-V Launch Vehicle. and H-IIB Launch Vehicles as well. For the next-generation solid fuel rocket, we plan to reform the launch system and improve the operation performance to the highest global standard by utilizing innovative ideas far beyond a simple combination of existing technologies. For example, we will reduce the time needed for the operation of ground facilities and launches to about one fourth of the time required for the M-V Launch Vehicle. To do this, we will make the vehicle perform checks onboard and autonomously and reduce the time required for operations on the ground. Ultimately, through internet, we will be able to check and control rockets anywhere in the world simply by using a laptop computer. We are planning to realize the world, where the launch control system is not necessarily at the launch site anymore. Such an innovative concept for a new solid propellant rocket will become a good model for future launch systems involving a liquid fuel rocket. Currently, onboard equipment is custom made to suit each rocket. Assuming that the rocket was a personal computer, onboard equipment for the rocket would correspond to the computer peripherals and are unique to that specific rocket. For our new rocket, we are aiming as much as possible to develop onboard equipment that can be shared with a family of rockets. For example, we are thinking of connecting onboard equipment through a high-speed network. Hence, if we use common interfaces on them, we can freely add or change equipment, or even put them on a different rocket just like computer peripherals. In other words, launching the rocket is just like using a computer. The launch of the rocket will become much easier, just like daily events. This dream era, where we can become much closer to space, is only a few steps away. 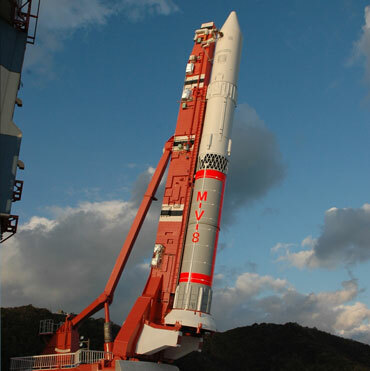 The next generation solid-fuel rocket we have been researching as a successor to the M-V Launch Vehicle was renamed the “Epsilon” Launch Vehicle in the summer of 2010 when it also entered the full-scale development stage. It was a perfect timing that Epsilon started its full-scale development just after “HAYABUSA” returned to the Earth carrying samples from the asteroid “Itokawa”. I feel the presence of some divine force there acting to support “Epsilon”. The first model of the Epsilon is planned to launch a small scale planet observing telescope, SPRINT-A. For future space development, it is equally important to launch small and responsive satellites, rather than just launching large-scale satellites aboard the H-IIA and H-IIB Launch Vehicles. It is the Epsilon that will perfectly respond to such needs. The Epsilon is the integration of the achievements of the solid-fuel rockets, obtained since the Pencil rocket era, and also marks a historical turning point. Up until now, the performance of a rocket has been evaluated simply by the launch capacity and the orbital accuracy. However, in this coming new space era, if we hope to make the access to space much easier, more sophisticated factors are required. The Epsilon is not only trying to enhance the advantages of conventional solid-fuel rockets but also develop into a next-generation rocket to meet the demands of the future. In other words, we are trying to make rocket launches much simpler and ordinary events. One of the challenges in achieving this goal is to develop advanced technologies like an automatic check-out system by making the rocket intelligent as well as the mobile launch control system. A large control room could be integrated into a single laptop PC. It looks like a science fiction fantasy has become a reality. We have already successfully completed the examination on a prototype model of the mobile launch control system and the real model will be realized soon. 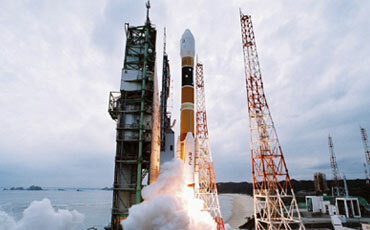 In January 2011, Uchinoura, “a sacred place” for Japan’s solid-fuel rockets, was decided as the Epsilon rocket’s launch site. The Epsilon is driven by the combined efforts of the solid-fuel rocket supporters and the Uchinoura supporters, so I’m very happy about that. Originally, the Uchinoura Space Center was renowned throughout the world for its unique compactness, and it will be more improved with a mobile launch control system. With this impressive combination of a simple structure solid-fuel rocket and a compact launch site, the Epsilon will undertake a mission to reduce the threshold of space for everyone. This will be a perfect development toward its first flight in 2013. 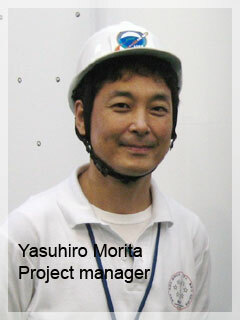 I would like to move forward together with space fans, not only with JAXA and manufacturers. Please continue to support the Epsilon.